A Mass of Christian Burial is scheduled for 9:30 a.m. Monday, Feb. 13, at Our Lady of Grace Catholic Church for Juan Huerta Lopez, formerly of Artesia. Lopez, 82, passed away Wednesday, Feb. 8, 2017, at his residence in Carlsbad. Fr. Martin Cornejo will officiate at the services, with interment to follow at Twin Oaks Memorial Park, with military honors performed by the Carlsbad Veterans Honor Guard. Pallbearers will be Felix Perez Jr., Rickey Leon Jimenez, Zachary Jimenez, Carlos Losoya, John W. Hoerath and Timothy Hoerath. Honorary pallbearers are Shawn Jimenez, Matthew Hoerath, and all of his nieces and nephews. No visitation is planned. A rosary will be recited at 9 a.m. Monday at Our Lady of Grace. Juan was born March 30, 1934, in Terlingua, Texas, to Juan E. and Maria (Huerta) Lopez. He served in the U.S. Army from 1956-62. In February 1953, he married Leonarda Romero. She preceded him in death March 27, 1988. He married Julia Carrasco in June 1995, and she also preceded him in death March 4, 2007. 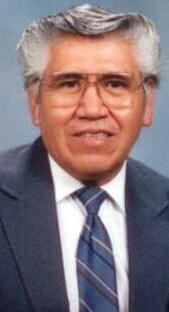 Juan began working for Payne Packing Company at the age of 16 and retired 52 years later at the age of 68. He was a longtime member of Our Lady of Grace Catholic Church in Artesia and was active in Holy Name Society, Eucharistic Ministry, and Divine Mercy Prayer Group. He was a Cursiesta and participated in Bible studies and choirs throughout the years. Juan also enjoyed gardening, music, singing and traveling. Survivors include sons Johnny Lopez and Christine Sheikh, and Orlando Lopez and wife Susan; daughters Diana Losoya and husband Joey, and Mary Helen Aguirre; brothers Jose Maria Lopez and Francisco Lopez; sister Celestina Herrera; eight grandchildren; and 15 great-grandchildren. He was preceded in death by his daughter, Alice R. Lopez; his parents; brother Florencio Lopez; sisters Felicita Moreno and Estefana Lopez; and great-grandson Alexander Hoerath. Arrangements are under the direction of West Funeral Home of Carlsbad. Condolences may be expressed online at westfuneralhomellc.com.